Babci hasn’t gone mushroom picking since before my kids were born and her 5 gallon glass jar of mushrooms is starting to run a little low. I’ve put it off for one reason or another over the last 5 years but we just got a patch of wet weather and although we didn’t have our “spots” in this area scoped out yet, I figured it was high time to do a little Shroomin. If you have a romantic image of what it’s like for me to be mushrooming with Babci, stop right here and keep that idealistic fictionalized image in your memory. I’ll admit that after a 1/2 decade, I also forgot what it was like to mushroom with Babci. In my head, it would be one of those mother daughter bonding moments that I will remember for the rest of my life. The mother, passing down the wisdom and lore down to the daughter. She will hike nobly with her home made walking stick and point out the sights and smells that only a seasoned mushroomer would know. In reality, it was a little different. First of all, there never was any hiking involved in the type of mushrooming my mom and uncle did. You had to have easy access to the mushrooms and your car. A day of mushrooming would be spent mostly in the car driving around vs in the woods picking them while trying to avoid the blood thirsty mosquitoes that you kicked up from the wet pine needles. The first thing you need to know about mushrooming is that in order to know where to find the types of mushrooms you are after, you must identify the habitats they like to grow in. We like Boletus because they are plentiful in this area and very easy to identify. Although there are dozens of varieties, most are all safe to eat and taste very good once processed. They have a very high moisture content so they are a little slimy on their own but after drying and reconstituting, they have an amazing earthy flavor that adds depth to any number of dishes. One of my favorites is wild mushroom risotto, but babci tends to throw a few in stews and soups and she makes the most amazing wild mushroom gravy during the holidays. We absolutely need to restock our stash because Christmas just wouldn’t be the same without that gravy. 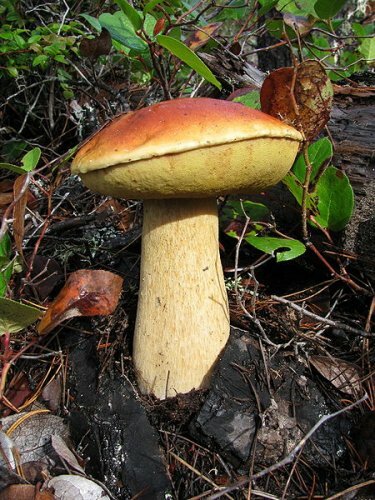 Boletus tend to grow all over the place randomly in New England, but the places where we look for large patches of them are in areas of thick pine forests that are literally covered with a blanket of orange pine needles. If there’s a small hillside, that also gives bonus points as they tend to like hilly spots too..I think they get more moisture that way as water flows down the hills. I’m not exactly sure, but that’s where babci likes to look for. Now, the absolute best places to look for boletus is under short stubby conifers that grow wide and low. The issue with these types of plants is these trees are also popular ornamental landscaping in people’s front yards. As you can imagine, it wasn’t long before babci was barking orders at me to stop the car and pull over to pick mushrooms off of some guy’s lawn. I said no way and things got tense fast. She claims that most Americans are too scared to be eating mushrooms off their lawns and they seriously don’t mind if you take them. I on the other hand, see miles and miles of forest ahead of us and decide I’d rather not trespass on someone’s property to get Babci the mushrooms she seeks. I did make a compromise and picked a few from the front lawn of one of the po-dink town halls we drove by but she will be mad at me for weeks for not picking them off this one guy’s lawn. I knew our day of mushrooming had to come to an end when she said to me for the 100th time “Why are you so afraid of people? They don’t mind.” “Mom, this property has an electric fence around it, they mind.” Silence for a few minutes, then “Oh, that electric fence is to keep the deer out, not the people. I’m sure it’s fine to go pick their mushrooms.” Oh Babci..I’m sure if I just let you loose with your 2 canes and beret hat, the people would think you were the cutest thing in the world and let you have your way, but for now, I don’t want to be your accomplice. On a side note, the hunting/fishing and foraging laws vary by state and are too complex to get into in this blog post, but most do have some form of recreational access to private land. There are also some very specific requirements land owners must follow on no trespassing signs (such as distance between signs, adding date stamps, colors, etc to be valid.) In fact, I think the ability to hunt and gather food is tied pretty closely to the right to bear arms but I would need a lawyer to help me figure out the latest laws on the subject by state and county. If there really was a gloriously huge and irresistible patch of mushrooms growing on someone’s property, I wouldn’t have an issue with knocking on their door and asking permission, but according to babci, we were still about 1-2 weeks early for the slippery jacks. She says that the poisonous ones show themselves about a week before the edible ones do…and where the poison ones grow, so do the others. I saw gobs of the poisonous ones on the route we took, so I think we’ll go back that way again. She also said the perfect time is 2-3 days after a good rain. Cool nights are also key. I’m not sure why though. I’m thinking it might be because there is more dew and fog which helps keep the ground moister longer. After a few hours of riding around we scored about 3 baskets of shrooms that will yield about a 12 ounce glass jar of dried mushrooms. This particular hobby gets less labor intensive the more you go because if you remember your spots, you don’t have to spend as much time searching. This is why you’ll seldom have people tell you their spots. It takes a lot of work to find them and there’s nothing worse than going to a spot and seeing that it already has been picked clean. There’s actually an awesome spot right behind my house. The land my house is on used to be a pine forest and there’s still a bit of it behind my house that has a public access point. Last year when I went looking, it had already been harvested. Ugh..this is the downside of living somewhere earthy crunchy…You actually have competition in some areas. Wish us luck for a good bounty. It just poured today so I’ll have to drag babci and the kids out midweek to go look for a few more. I’ll end with a photo of me at age 10 and a typical score from a day of mushrooming. This was enough to last a whole year or more once dried and/or pickled with hot peppers. It really is one of the more productive foraging options once you’ve done your scouting and know where to go. Plus, dried mushrooms are super expensive and some varieties aren’t even sold in stores. If you live in the Northeast or the Northwest, it’s a great hobby if you like the taste of mushrooms. Last but not least, if you decide to take the plunge, make sure you get a good mushrooming book that is tailored towards your region. The best one I’ve found for my area is called Mushrooms of Northeastern North America. PS. Don’t use this blog article as your sole source for mushrooming information. Do your research first. Babci has a whole host of tricks she uses to test eatability from touching it with her tongue to just throwing them out completely if they aren’t a type she’s seen before. Take care to do your research and do it right. heehee… yeah, stay away from the electric fence. Awww – just look at you, you’re so cute! Reminds me of when we used to make about 500 home-made donuts or 20 loaves of bread in a day and have them stacked up on the kitchen table. We never went shrooming. Lots of saskatoon berry foraging though. It has occurred to me that it wasn’t really that common to eat a lot of fruits and veggies (except potatoes) when I was growing up. Yet we were freakishly healthy – funny how that is. 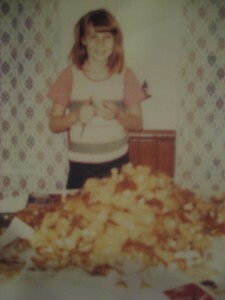 Jacq – this is just after I got bigger than my mom and I could fight her off from giving me a bowl haircut. How on earth does one make 20 loaves of bread in a day. Did you have one of those restaurant sized mixers or something? Mmm mushrooms. I have always thought about doing this, but have never actually followed through with getting educated about how too. I love that picture. Holy moley mushrooms. Niki – it’s really not that hard if you stick to the easy varieties. Like, you can pretty much eat most things that grow on a tree stump (like oysters, etc), but they may not all be choice eatables (like the turkey tail which technically you can eat but tastes like tree bark). So, there is beginner level stuff that anyone can do fairly safely. Anyway, it seems like you have pretty good knowledge of searching for mushrooms. I’m not knowledgeable about that activity, but I do know that at trendy, exotic food stores, some types of dried mushrooms can sell for quite a bit of money. I can understand, by the way, why you wouldn’t want to run onto someone’s lawn to grab mushrooms. I wouldn’t do it, though Babci is probably right that most people would be too scared to eat mushrooms from their lawn. A prior older home I owned had a patch in the front yard in which some mushrooms would sprout a few times every year. Nice front lawn, but those mushrooms just popped up quite a bit in that area. I viewed it as a nuisance, and frankly would have been cool with someone helping me out by taking them all! Squirreler – I love lawn mushrooms. I think they look so cool. I don’t eat lawn mushrooms. Oh, I’m so jealous. I had no idea that your spot in the Berkshires was such a trove. Frugal scholar – yes, big parts of new england and the adirondacks have loads of mushrooms…I mean everywhere. Rb40 – yes, being poisoned is not cool. I can see how that would turn you off. Really? Electrical fence won’t keep Babci out?! Molly – I had no idea they had mushrooms in the southwest…cool. Yes, the electric fence is classic babci moxiness. How do you know though if people aren’t treating their lawns with pesticides? That would put me off. Jacq – That was exactly my argument. My husband picked some morels off my mother in law’s lawn. They were growing right near her foundation and I know she uses bug killer to keep the ants out there. No way was I eating those. Sandy – Yeah, I love them. My husband’s just okay with them. He actually asked me to make less things with mushrooms recently because I “mushroomed him out”. Great Babci story as usual, Sandy… not a whole lot of mushrooms here in Oklahoma, a bit dry and not enough evergreens. Reminds me of the way Italians are about ] porcini mushrooms. You can confess anything you like to your dearest friends, but prime mushroom spots ain’t none of their business. 101 – about the Italians…it’s funny because it’s true. I would be too scared to go mushrooming without an experienced “mushrooming mentor” to help point out the dangerous ones – I’m bad enough at identifying trees, never mind edible, potentially poisonous fungi :(. Kellen – well, they are like herbs. They lose some of their flavor over time but don’t really go rancid or anything. They get hard like bark eventually. The really old ones you can still reconstitute but they’ll be very chewy, like leathery chewy, so I’ll either grind them up in a food processor or just use them for flavoring and then discard them come meal time (like a bay leaf). That’s a lot of shrooms! A lot of lawns here have little button-looking mushrooms growing, but I am so clueless about poisonous vs. safe. I am sure I would pick totally the wrong type and die on the spot. It is great you guys have knowledge about something useful and interesting. Just don’t get electrocuted during your hobby. I hope Babci doesn’t buy a taser to use on you to get you out of the car and force you to pick the mushrooms! Kris – Oh my god. Babci with a taser. What a thought. She can get pretty snippy when she doesn’t get her way. I’d hate for her to be armed.